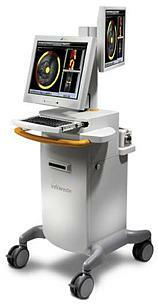 The TVC Imaging System is a novel and unique combination of the complementary technologies of IVUS and NIR spectroscopy. 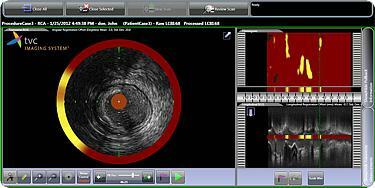 In a single pullback, the physician obtains accurate, co-registered information about plaque structure (from IVUS) and composition (from NIR spectroscopy). This combined information helps physician with decisions regarding the need for a stent, the likelihood that stenting complications might occur, and the results of stent placement. > manufactured by InfraReDx®, Inc.